For security reasons, only the Account Holder can change bill delivery options. To grant the ability for another user to manage your account, see Adding a Secondary User. Sign into My Account with your User ID and Password. Go to the My Account home page and click Enroll in Paperless. 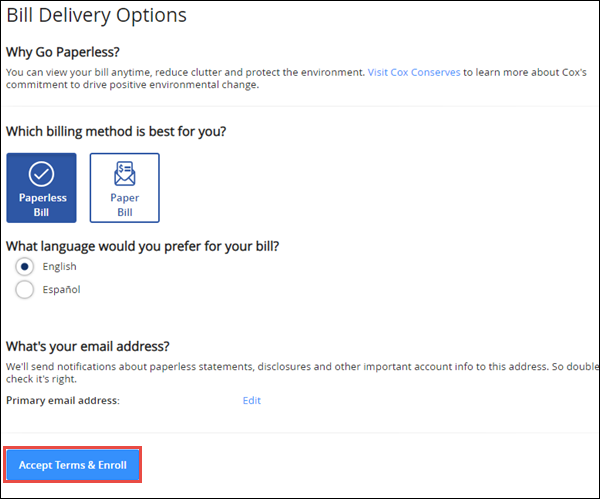 From the Bill Delivery Options page, select Paperless Billing as the delivery method for your bill. Note: If you need to update the email address where the bill will be sent, click Update Email Address. 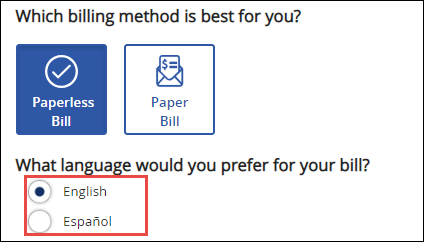 Select the language you would prefer for your bill. Verify the Primary email address. Note: If you need to add or update the email address click Edit. Click Accept Terms & Enroll to confirm your delivery method.